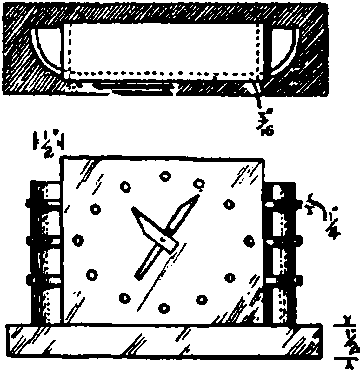 The clock case shown in Fig. 41 and Plate 3 V consists of a box made from 3/16-inch sheet, cemented together; the rounded end-pieces are made from 1/2-inch sheet with the front edge rounded off, and strips of light-colored material heated and bent to shape and cemented on for ornament. The hour-marks are 1/8-inch sections of light-colored round plastic rod, cemented on. and the hands are of chrome plated brass. The base is a sheet of 1/2-inch ivory or mottled white or it can be made from a block of maple, to save weight. Fig. 41. Plan and elevation of the clock described in Project 39. Cream-and-Sugar Set Project No. 31 Materials: #7 scalloped cyl., 1/3 of a 1/2" sheet, 1/4 of a 1/4" sheet, handle rod. The project illustrated in Plate 3W and Figure 42, a cream-and-sugar set owes its outstanding attraction to three factors, the striking simplicity and dignity of its lines, the pleasing contrast of colors, a figured milk-white for the body, jet black for the handles and spout, and morroco red for the lids, and the Grecian note added by the fact that this particular material is available in 3-inch scalloped cylinders. The first operation is to make the mandrel to hold the cylinder while turning it. For single jobs, any chunk of odd wood 8-inches long and 3 3/4-inches or more diameter will do. 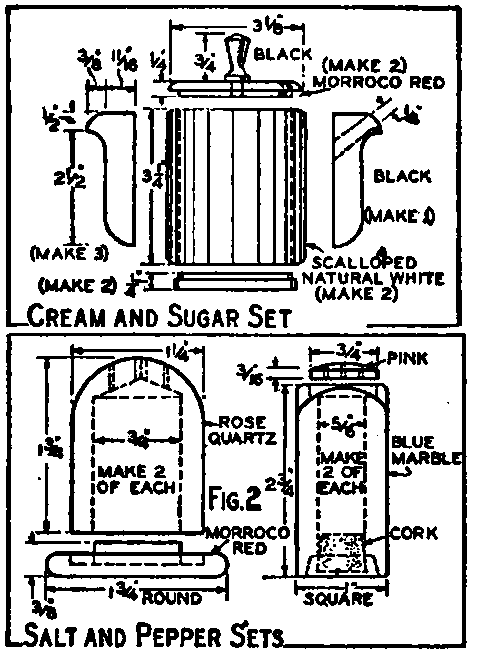 Turn it down, with a very slight taper, to fit the inside of the cylinder, which also has a slight taper, and proceed to cut off and shape the two pieces forming the bodies of the creamer and sugar-bowl shaping the ends as shown in the diagram, Figure 42. Because of the scallops, these cylinders cannot be polished in the lathe like other cylinders but must first be lightly sanded with 7-0 or 8-0 sand or garnet paper, then buffed and polished on a wheel or by hand. Next cut out the four pieces of 1/2-inch black material for the 3 handles and the spout, which are identical in contour, on the jig-saw, band-saw, disc sander, Plate S, or by hand, and bore the hole for the spout, as indicated, and which is flared a little at the outer end. Match this hole with another made in one cylinder. Where the handles and spout are cemented to the cylinders, one "scallop" is ground or filed off, leaving a flat surface just 1/2-inch wide, to which these parts are cemented. In turning the shoulder on the bottoms, do your testing of the fit inside the cylinder while the piece is cool, as this material tends to expand slightly when hot. The top and knob present no difficulties. Finish by buffing and polishing in the usual way. Fig. 42. (Upper). Dimension-sketch for the cream-and-sugar act in Project 31, a very popular design. The handle* are jig-sawed or shaped with a grinding-wheel or sanding-disc from 1/2" sheet, and a 1/4" hole bored thru one of them to make the spout. Fig. 43. (Lower). Two salt-and-pepper designs, described) in Project 32. 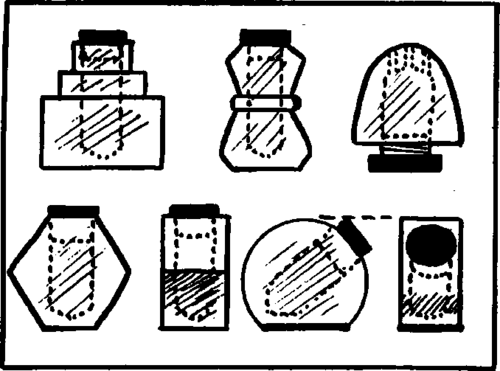 Figure 43 lower show two suggested designs for salt-and-pepper sets, capable of infinite variations of color and shape. The design on the left is made from 1 1/2 -inches round rod, and the other design from 1-inch square rod. Both should be bored out in the lathe, with either a drill-bit or a lathe boring tool (never a wood augur), proceeding slowly to avoid jamming or overheating. Fig. 44. Six more suggested designs for salt-and-peppers. The design in the lower right is cut from section eat from round rod; the others are all turned. Several additional designs for salt-and-peppers will be found in Figure 44, and photos of some interesting designs will be seen in Plate 3X. For the most part this type is turned from solid round rod, or uses plain square rod, with a 3/4" hole bored to the proper depth, and the little holes bored on thru for the salt and pepper to come out. Some have the caps on top, with holes in the cap, others fill from the bottom, with screw-threads on cap and body in either case.